By Glass Barn Doors, we do not mean something that would be placed on the exterior of a stable or farm house. Instead, interior glass barn doors are beautiful, sleek and space saving. Using rugged top hanging hardware, the door effortlessly slides along a track with beautiful thick, safe, and elegant glass. The glass allows natural light to enter and flow from one room to the next or otherwise dark areas such as closets and pantries. At Tri-City Glass we are experts at procuring and installing the very finest glass barn doors on the market. These specially hung doors are very distinctive and offer much in the way of style and design flexibility. You may choose from many different types of styles of glass (clear, textured, etc…) or even a solid door. They slide on a horizontal track which is mounted flat to the surface of the wall. This is great option if you are not thrilled about hinged doors or have other space restrictions. Not only are your choices unlimited with the types of glass available, Tri-City Glass works with the top hardware manufacturers that enable you to have a perfect combination of customizable glass, accented by an array of different hardware barn door options. On top of only using the highest quality materials, Tri-City Glass has demonstrable excellence in installing your doors so they work perfectly. Just because our glass barn doors can be customized, this doesn’t mean expensive. In fact, many of these options will be less than what you might think. Of course, we also aim to help you make the right choice for your décor and home situation. And, we do offer free estimates, given by fully trained, licensed, and insured technicians. 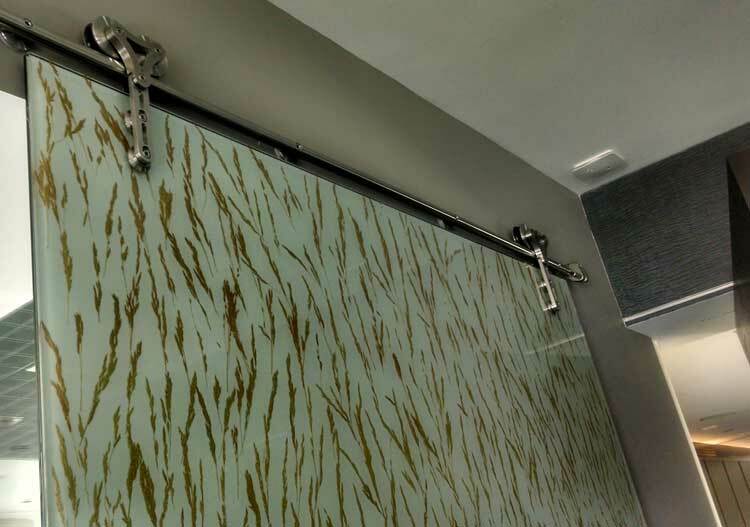 Glass barn doors offered by Tri City Glass can have several different sliding options. For example, a pantry door might only slide to one side, with specially made frosted or tempered glass. If your glass barn door is meant for an office or other area where a bit of privacy is needed use textured glass for a distorted view to ensure the needed level of privacy.